Today is the last Sunday of the Christian year. Our new year always begins with the first Sunday of Advent, which is next Sunday, December 2, as we begin our waiting for the arrival and birth of our savior. Throughout the Christian year, we remember the life of Jesus: our longing for a savior at Advent, the birth at Christmas, his childhood and life’s meaning at Epiphany, his ministry and sacrifice during Lent, his resurrection and salvation during Easter and the following Easter season that runs into Pentecost, the arrival of the Holy Spirit, who is the fulfillment of the promise of Christ to always be with us. So today, we remember that Christ is King. We are mindful of the Kingdom of God. But what’s the point? We look around us and we see a world that doesn’t much look like the Kingdom of God. Each day brings with it new descriptions of violence of many kinds. Since January 1, 2018, for example, there have been 312 mass shootings, almost one per day. The news fills us with this and other information like it, bringing with it despair over the state of things. Where’s the hope? What’s the point? In the same time period, millions have gathered across the country for worship. We have done our charity work, we have grown in our faith, we have done our Christian duty, we have done things characteristic of the Kingdom of God; but what results do we see for our efforts? What can we point to, look at, as evidence that our work here is making a difference? So, on this Christ the King Sunday, mindful as we are about the kingdom of God, we ask ourselves what’s the point? In our scripture this morning, Pilate, too, asks “what’s the point?” He can’t figure out what he needs to figure out, and so, in despair, he asks “what is truth?” Let’s hear the scripture of the very famous exchange between he and Jesus, while Jesus is on trial, in John 18:33-38a. Pilate has been tasked with figuring out if Jesus is a king. The Jewish courts have already found Jesus guilty of saying he’s the King of the Jews, something they consider blasphemy. They believe he is worthy of the death penalty, but since they do not have the death penalty at the moment, they turn him over to Pilate. Their word to Pilate: he says he’s a king, that’s a threat to the emperor, you’d better take care of this insurrectionist. The words of the Jewish authorities carry a threat of their own. In the time Pilate’s been governor of Judea, he’s not had a good relationship with the Jews. Each side has angered the other, each side has resentments they carry around. The last time there was an incident, in which Pilate erected what Jews considered to be graven images of an idol in Jerusalem, Pilate moved brutally to crush their dissent. The Jews appealed to the emperor, Tiberius, who ordered Pilate to remove the images. In a classic move common to any of us who have bosses, the Jewish authorities went over Pilate’s head, resulting in a black mark for Pilate as the boss overruled him and reprimanded his actions. The easiest thing to do, the politically expedient thing to do, and the best move for his career, is to simply accept the verdict of the Jewish court and agree to have Jesus executed. But Romans were very much the law and order type, with an emphasis on order. Jesus wasn’t a Jewish citizen, but he still deserved to have Romans judge him by their law. So Pilate decides he’s going to determine if Jesus really does claim to be a king and if such a claim is a threat to the emperor. Thus Pilate’s first question: “Are you the King of the Jews?” That’s what we call a closed-ended question: it can be answered with a yes or a no. Simple question. But this is Jesus. The answer isn’t simple. Jesus says “Do you ask this on your own, or did others tell you about me?” I can feel Pilate’s frustration mounting. To him, this feels like a non-answer, a dodge. So Pilate tries again, “I am not a Jew, am I? Your own nation and the chief priests have handed you over to me. What have you done?” Pilate’s trying another avenue to get at his question of whether or not Jesus claims to be a king and whether or not such a claim is truly a threat. But, once again, Jesus comes across to Pilate as coy, “My kingdom is not from this world. If my kingdom were from this world, my followers would be fighting to keep me from being handed over to the Jews. But as it is, my kingdom is not from here.” So, Jesus is kind of admitting to be a king, for only kings have kingdoms, and Pilate senses an opening to get at what he needs to ascertain: is Jesus a threat? Thus, Pilate says, “So you are a king?” I can hear a hint of triumphalism in his voice. He’s got Jesus in a corner. But this is Jesus, who answers, “You say that I am a king. For this I was born, and for this I came into the world, to testify to the truth. Everyone who belongs to the truth listens to my voice.” What is Jesus really saying? 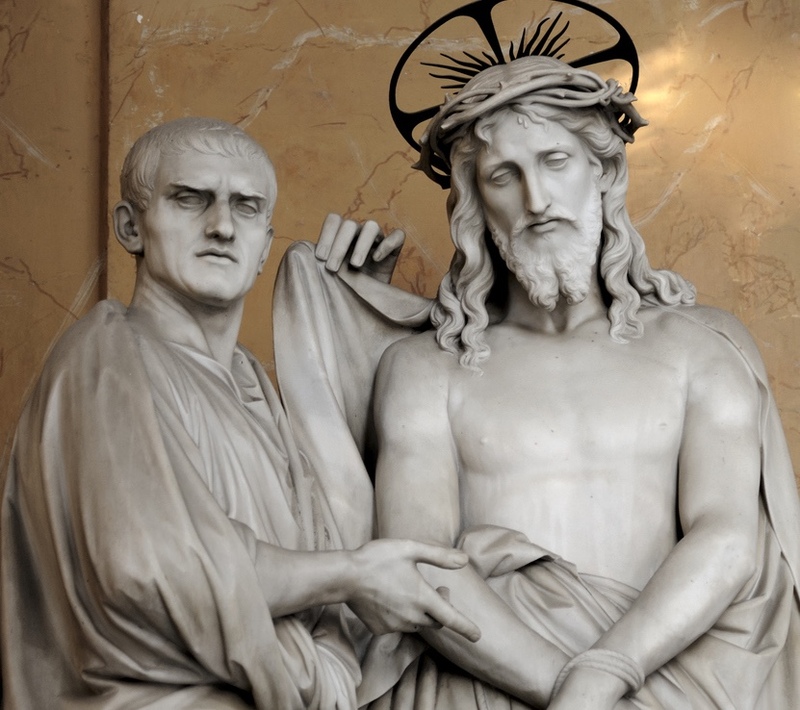 Pilate’s central question: is Jesus a threat? remains unanswered. And so Pilate gives up, eventually turning Jesus over to the angry mob outside to be executed. He’s trapped between that angry mob that could turn rebellious and a man who’s potentially an insurrectionist and threat to the emperor or, at least, the stability of this vital trade region for the Roman Empire. So he does the politically expedient thing; he turns Jesus over to be executed. But not before uttering a very famous question, “What is truth?” Jesus had just said “everyone who belongs to the truth listens to my voice,” and in a fit of frustration, Pilate throws up his hands in defeat saying, “What is truth?” He can’t find the truth he needs to find: the truth of whether or not Jesus is a king or a threat. Jesus won’t give him direct answers, so he cannot determine if Jesus is a threat or not. In despair, he gives voice to that same question we’ve been asking: what’s the point? I empathize with Pilate, even though he’s a central villain of the crucifixion story. I have, at times, thrown my hands up in the air and said, “what is truth?” a question that inevitably leads to asking the classic question of despair: “what’s the point?” The first time I remember being rocked in that way was September 11 as I watched planes hit the twin towers and felt the fear of the subsequent weeks. I wondered how a loving God could allow such evil to occur? I thought we were supposed to be protected by that God? How could that be? In the years since, I have felt at times those same feelings and asked those same questions. The last time was over the conference table in the church office as we discussed how to do the food boxes this year. That conversation revealed the depth of poverty of our neighbors in dodge county: families whose struggles are so deep, they cannot afford electricity to keep their refrigerators running, so they could not keep the turkey or other refrigerated materials we provided; others who had received food from elsewhere, but their children had no diapers, no formula. Too many were unable to do with the food provided because of their suffering in poverty. And I asked myself why God would allow so much suffering to occur. I despaired over the plight of our neighbors. What is the truth of our situation? Is there hope? When confronted with these stark realities, here at home and in the news, what’s the point of our worship, our labors, and our faith? The irony in this scripture is profound. As Pilate asks “what is truth?” He’s staring Truth in the face. The gospel of John opens with a declaration that Jesus is truth: “In the beginning was the Word.” That final word is the English equivalent of Logos, which could just as easily be translated as Truth. John’s gospel, in your Bibles, could be translated as “In the beginning was the Truth, and the Truth was with God, and the Truth was God.” Pilate is staring Truth in the face, but he can’t see it. Such is the case for us. We are staring Truth in the face, but sometimes, we can’t see it. If Pilate had answered that question, even if he’d said, “I don’t know who you are,” there would be a gateway to Pilate’s heart. In that moment of confession, of admitting his confusion, of admitting that he didn’t understand Jesus, he could have received understanding. He needed to see the world around him differently; he needed a different lens with which to view this moment. And so it is for us. We need a different lens with which to see the world: the lens of imagination. Such imagination is not some dream, but rather the gift of faith to see the world not as we see it revealed through the news or through our own despairing, but to see the world as God sees it and as scripture reveals it to us. Divine imagination gives us the lens to see the Kingdom of God, the hope of the world, all around us every day. We, too, are staring Jesus in the face, but the question is whether or not we have the lens, the imagination, to see him. Jesus is in our food boxes, in the servant’s heart and attitude of those who will deliver them, including our youth who will be assisting. Indeed, I see Jesus so often in our youth who are hungry to grow in their faith and who willingly give of their time to this church. And Jesus is in your donations, for $40 could have bought you a nice dinner, could have paid a subscription to Hulu or part of your cable bill, or bought you something nice. But you sacrificed, giving above and beyond what you’re already giving to the church. Jesus is in our small groups that continue to foster spiritual growth and change lives. Jesus is in our children’s ministry that inspires our kids to live lives of faith. Jesus is in our children themselves, who come to us with the big questions, who demonstrate a depth of love and compassion that reminds me all the time to be more loving and compassionate. Jesus is in the leadership of this church who work tirelessly to make this a wonderful place of worship and a bastion of service to this community. I came here asking the question, “if the church disappeared tomorrow, would the community notice?” Increasingly, the answer is yes. Jesus is in my pharmacy that greets me warmly and goes out of its way to serve me and my family. Jesus is in my experiences with our hospital and doctors, who do just the same as my pharmacy, going above and beyond what they are called to do. Jesus is in the work of nonprofits and government agencies in our community such as, for example, CASA, the food bank, and Communities in Schools, who labor to provide for a better world for our children and those who struggle under the weight of poverty. Jesus is in reformed lives of those who have gotten out of prison and never returned. Jesus is in those you know who have been healed dramatically from old wounds and pains of the past. Whenever I despair, I think of so many of you, and I see Jesus. Worship, faith, growing in Christ-likeness, gives us the vision, the lens, the imagination, to see the world as God sees it. God looks down upon our world, even our little town, and sees how we are, together, building the Kingdom of God. That’s what Christ has empowered us to do, Christ who lives within us through the Holy Spirit. When God looks at us, God sees the violence and reasons to despair, but God sees a Kingdom of justice, peace, and joy being built in our midst. One brick at a time, we are laboring to bring about that Kingdom, of which Jesus is King. Jesus is staring us in the face. The question is whether or not we have the imagination to see Jesus. And gaining such imagination begins by knowing where to place our hope. Our hope must begin and end in Jesus Christ himself. We despair so often because we have misplaced our hope. Human institutions will always let us down, people of their own accord will always let us down, our leaders will let us down, I will let you down, but Jesus never will. And if we can look past the ways we’ve been let down, look past the violence we hear reported, look past all the reasons the world gives us to despair, we will see the Kingdom of God, just past our despair, because we will see how God is moving and active in the world, moving and active through us. Can you see Jesus this morning? Can you see the kingdom of God? If you can’t, keep coming to church and keep seeking to grow in your faith. If the vision is hazy, keep coming to church and keep seeking to grow in your faith. If you can see the Kingdom, keep coming to church and keep seeking to grow in your faith. For that’s how we learn to see past the distractions to Jesus, who is staring us in the face; to see Jesus, who is our hope. What’s the point? Of our worship? Of our labors? Of our faith? To see Jesus, for he is here, in our midst; he is King, and his Kingdom is hope for this world. The Kingdom of God is justice and peace and joy in the Holy Spirit. Come, Lord, and open in us the gates of your kingdom. Amen.